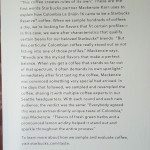 If you subscribed to the Roastery subscription coffee, your April coffee was the Colombia La Union, roasted of course, at the Roastery in Seattle. I will tell you that one thing I love about the Roastery – in fact, perhaps the one thing I love the most about the Roastery – is the ability to experience coffee in so many steps of its journey. 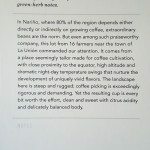 You can experience the coffee you’re drinking in a journey from green, unroasted been to fully roasted, to your cup at the Roastery or at home in your kitchen. 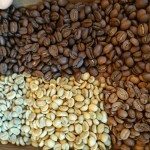 An early stage of your coffee bean’s journey (at the Roastery) starts with the coffee being loaded into the “green coffee loading pit.” If you don’t know what that is, please do back and read that article! 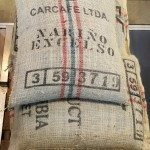 I was at the Roastery today (Sunday, April 17, 2016) and took some photos of the burlap coffee sacks which the April Reserve Subscription coffee came in. It’s from the Narino region of Colombia. While the subscription coffee was already roasted, there were still a number of burlap sacks of it hanging around the Roastery. I caught up with Coffee Roaster Shawn, who said that he was roasting this coffee to be sent to the CAP market. 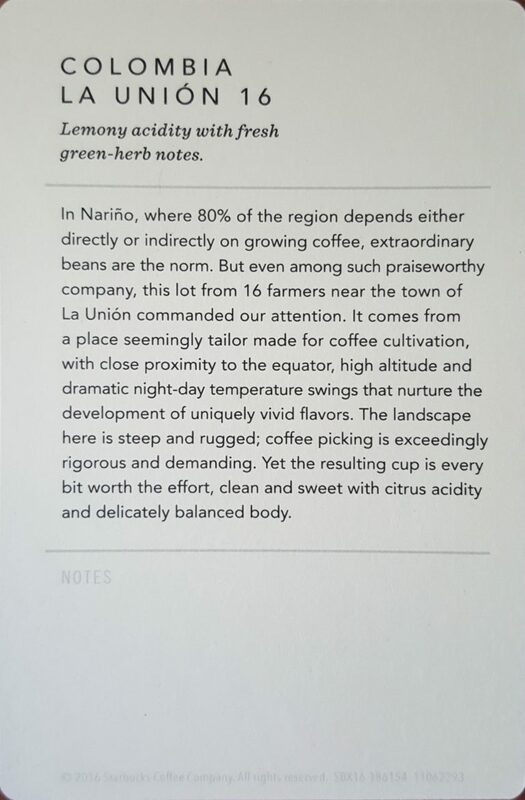 (That is, a batch of it will be shipped to Starbucks Reserve stores in the China Asia Pacific market). 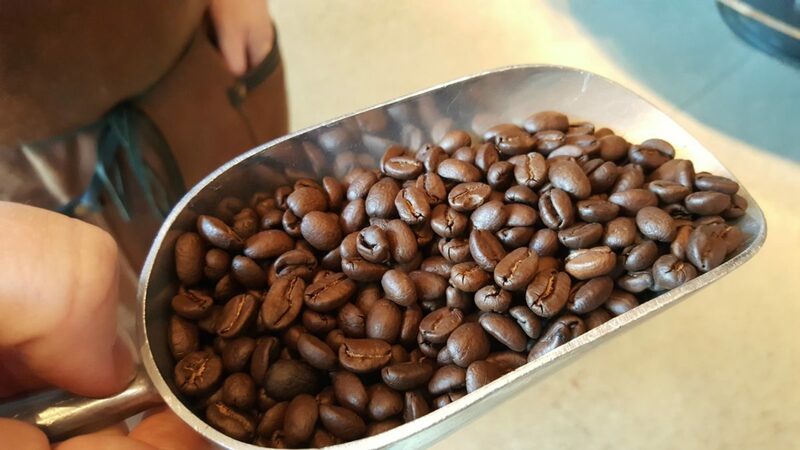 As the roasters roast the coffee, sometime they pull out samples of it at various stages of the roasting process. I love this! 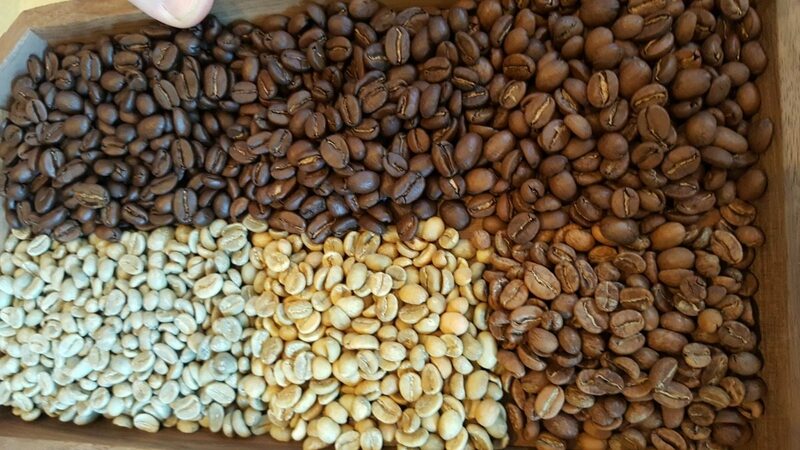 It’s beautiful to see the color change and development of the coffee from green bean to fully roasted. 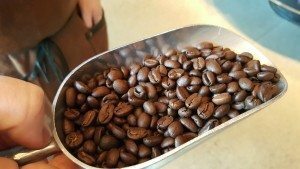 After the first “crack” of the coffee, sometimes the beans even seem a little larger (they are very very slightly larger) as they’ve expanded to release caffeol (coffee oil) in a chemical process called “pyrolysis” – starches convert to sugars, and proteins break down. 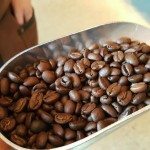 Click here to see the coffee coming out of the roaster. Your coffee goes through another step of ensuring that there are no particles are accidentally mixed in. 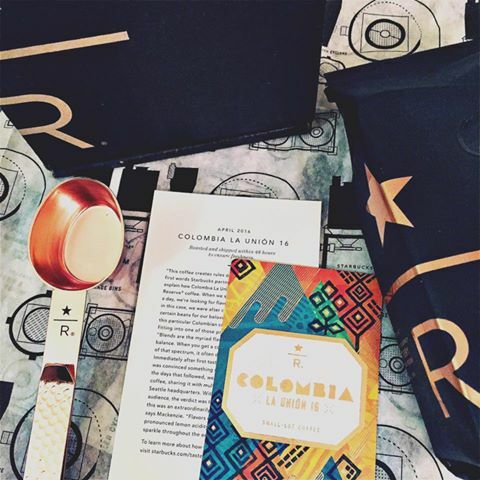 And then the coffee gets quickly packaged for you to enjoy at home. Sometimes people think that the freshest and best coffee is when it’s immediately done in the roaster. That’s a misconception. All coffee actually goes through a de-gassing phase, following its roasting. You can think of it like a green banana that has to ripen a bit to reach its maximum flavor. The de-gassing time is up to eight days. At about five to eight days, you have de-gassed coffee. If your coffee is loose and not in Flavorlock packaging, as shown in the black packaging below, consume your coffee within 7 days following the de-gassing period. After that, it’s considered expired. If your coffee is in any kind of Flavorlock packaging, simply use it up before the expiration date on the back of the bag. Once you’ve opened the Flavorlock bag, use the whole thing within 7 days. Any coffee opened more than 7 days is considered expired. When it’s all done, your have beautiful coffee to enjoy at home! Look at the beautiful Colombia Nariño beans! They are indeed fairly large. 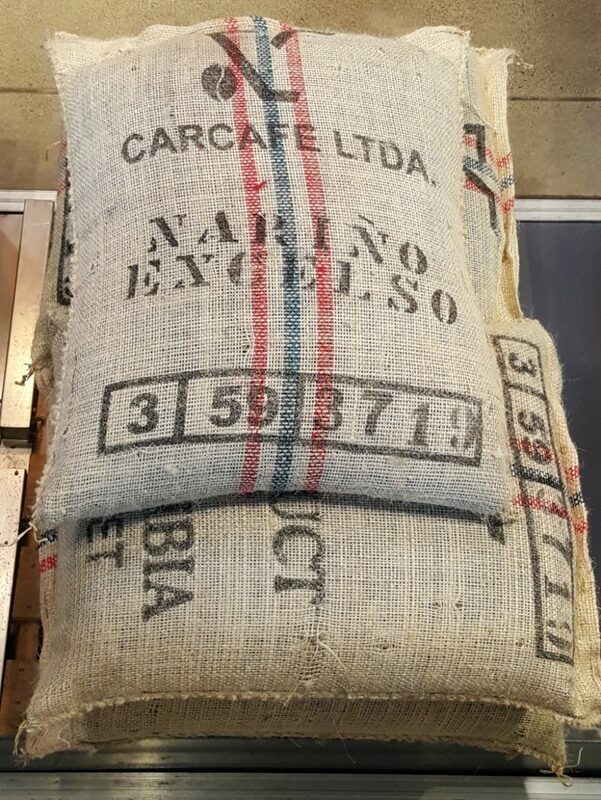 Some Colombia Nariño beans are called “supremo” which indicates that the beans themselves are very large in size. 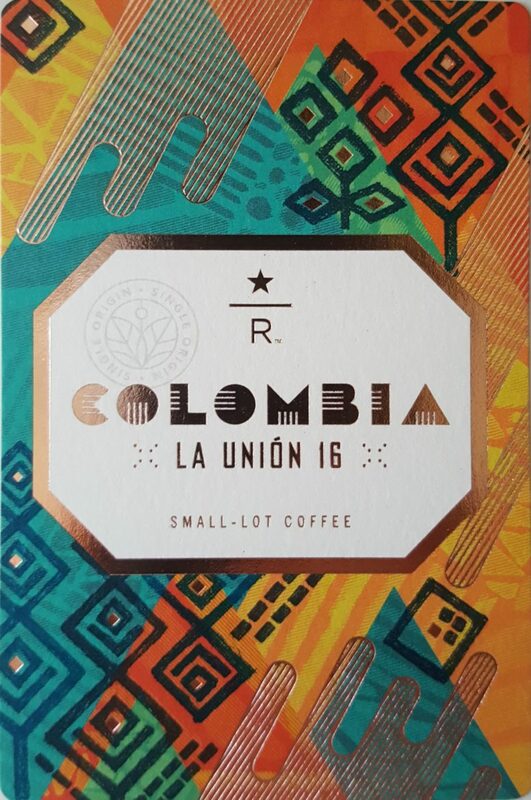 The Colombia La Union beans are considered to be “excelso” beans, identifying that the beans themselves are slightly smaller than the Colombia Nariño Supremo beans. Hope you enjoyed your coffee education lesson! 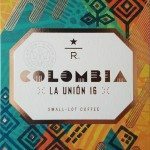 If you want all Reserve coffee news all the time, or if you want to see if you have all the Starbucks Reserve tasting cards, please visit DiscoverStarbucksReserve.com. A coffee event with Starbucks Cheesecake, Brown Butter Apple Tart, Ethiopia Harrar, and Aged Sumatra and more … all available at the elevated beer and wine stores. I LOVE reading your articles! Always learning something new. This one is particularly interesting (and savory)! They have just brought this out in the UK reserve stores.